The Linksys Smart Wi-Fi and Linksys Wi-Fi Routers have the ability to create a separate network for guests. This feature allows your guests to connect to your wireless network without being able to access your main network. NOTE: In this scenario, your computers and other wireless devices have active and stable Internet connection through your router. QUICK TIP: Before connecting your Android™ smartphone, ensure that you have the Guest settings of your router. To learn how, click here. On your Home screen, tap the icon. IMPORTANT: Make sure the Wi-Fi is turned ON. 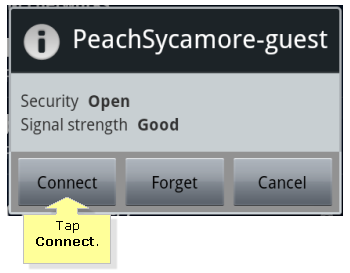 Select your Guest network and tap the Connect button. NOTE: The Guest network will appear unsecured in the list of available wireless networks. However, a login page will appear upon opening a web browser asking for your Guest password. On the Log In page, enter your Guest password. Your Android™ smartphone should now be successfully connected to the Guest network and to the Internet. QUICK TIP: You can also check your Android™ smartphone’s Status, Security, Signal strength, Link speed and IP address by tapping on your Guest network.